Very attractive scene. Did we see the bird bath earlier in the year? Looked very different then. Love Rubbeckias, Mine are still small, I Planted them late due to lazyness, :) ..Dee.. Very good eye Celandine, and memory ! The birdbath is the same but I had a very large autumn clematis climbing up the right side,almost hiding the bird bath.Now it's alot more noticeable. I had to cut my vine down to the ground a few days ago. I've had a new pest enter the garden, haven't even looked it up yet, too disgusted. In three days time, they had eaten off every leaf and flower bud, it would have started blooming in about two weeks ! Luckily this type of clematis are very hardy and can take that type of severe pruning, but I'm so ticked off that I won't get to see it bloom or smell it's sweet fragrance over by the arbor this year. This garden area is jam packed with lovely displays. So nice to walk through. And your pond is great looking too. All your hard work has paid off. It's beautiful Flcrazy. I like the arch with everything growing over it. - Wonderful. My pereniial rudbeckia is just coming into flower now. I find that if I keep deadheading, it goes on for weeks and weeks. We had a hot summer and mild autumn in 2006 and it started flowering for a second time at the end of November! I'll have to try and keep them watered, and give that a try Andrew, never deadheaded these to see if it would rebloom, thanks for the info ! Great shot Flcrazy, i started with one Rudbeckia Goldsturm and every other year i split them, i must have half a dozen patches now and they all give a superb show. Fabulous garden Flcrazy, makes me want to get my flight booked and come and see it and the swallowtails!! Come on Janey, times a 'wastin',girl ! The drought I'm dealing with will not allow them to look like this for very long ...lol ! Another beautiful picture of your beautiful garden. Had to look up the word "drought" (!!). Still persisting down here and windy. We live in the bump that sticks out on the south-east coast - no land mass between us and Iceland. In Norfolk the wind is called "lazy" because it goes through you (not round!). Well Magnoliatree, I'll give you my definiton of the word drought. It is,... 'to ponder one's sanity, and ability to make good decisions, when one's flowers require tons of water, and you're not getting any'...does that sound about right...lol ! Great definition! I'll try to bear it in mind. Lori , the tall silvery one on the right is Artemisia ludoviciana, called western wormwood, and this just happens to be hardy to zone 4.The pink blooms behind it, are phlox and yarrow. hmmm... my ludoviciana has golden flowers ...the plant looks metallic...lol. silver foliage and golden flowers... how many types of ludoviciana are there, do you think? Yours is so pretty and lacy that I took it for a different plant altogether.. Tons of them I think Lori...lol. This one doesn't get the lovely golden cone type bloom. It gets very tiny, insignificant yellow blooms on the tips of each stem, it was given to me, by a friend and neither of us know the cultivar. I just let it do it's thing, I did finally get around to giving it alittle trim though, it was getting too tall and blocking out the plants behind it.. The blossoms get ratty on mine so I regularly just give them a haircut after they finish blooming... the leaves change shape after I do..they go from being lanceolate to having three lobes....very strange aye? I really like this plant...I've had mine since my first season's garden...I think I mentioned before that I like the silvery leaves in the moonlight...planted a moonlight garden the first year...but the streetlights are tungsten red...lol. Wonderful job. A beautiful spot. Keep up the good work! You have a garden to be very proud of, I love it to bits. Thank you both, and please thank your wife for me too, that was quite a comment, I really appreciate it! Wow!! 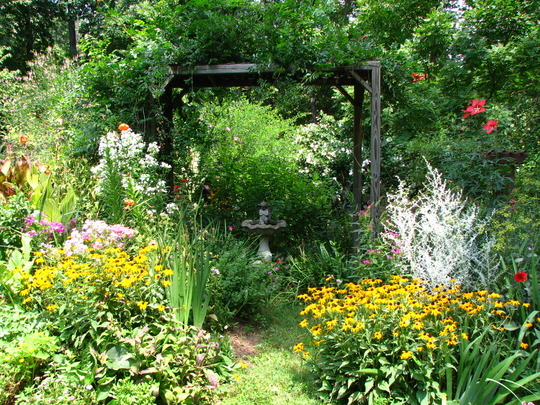 this looks great Flcrazy- I can see you enjoy your garden and that you spend a lot of time caring for it. my rudbekias are still blooming and its the last day of oct .